The Sleeping Buffalo Hot Springs has humble origins. A wildcat oil rigger testing for oil in the 1920s struck hot water at 3,100 feet, according to a 1962 Phillips County history. 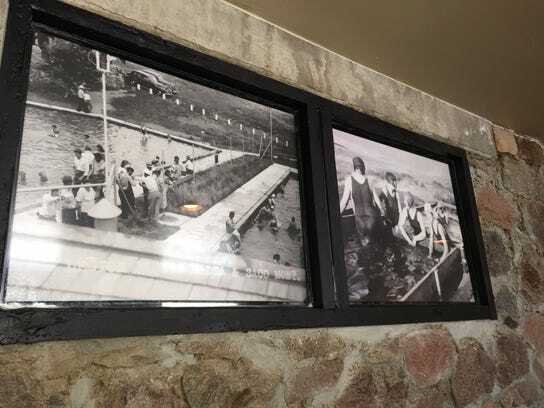 Then Saco rancher Elbert Davison, whose son had polio, had the idea of building a pool for his son to soak in, which proved popular for others, too. The American Legion posts in Saco, Malta, and Hinsdale worked together to capture the natural gas in the water without shutting down the water. No longer would the water ignite at the “burning well.” The resort aspect began as a New Deal, Depression-era project, launching the Legion Health Resort. While we were there, a vanful of Saskatchewan Hutterites arrived and I got to talk with one of them. Very interesting to meet them and hear about their religion. The handful of other visitors who came were either from Canada or from nearby in Montana. We basically had the whole area to ourselves for most of our visit. I took advantage of swimming/wading while the pool filled up on the first day we were there. In recent years the old site, a very run down and stinky place, closed. The reviews we saw on the web were pretty bad so I almost didn’t go. BUT, I found a couple of articles about a Bozeman couple who bought the place and renovated it. I’m so glad we stopped! The Sleeping Buffalo has three pools, a large one at a comfortable swimming temperature, a smaller hot pool and a cold plunge pool next to the sauna. The pools drain nightly, which prevents staining. In the hot tub, water flushes through every 20 minutes, and in the big pool it’s every three hours. The mineral-rich water flows from the well at 108 degrees and 750 gallons a minute. Just a warning that the hot tub is super hot, but relaxing. There is also a sauna. Ten motel rooms are under construction, and the Sleeping Buffalo will have a KOA campground with 20 cabins and 75 camping spots. Very soon, Simpson will start work on outside pools. Right now there are three cabins and at least 35 RV spots with hook ups. The resort isn’t planning a restaurant right now but does offer snack food, pizza and hot dogs. There is also a bar next door. Be sure to stop at the sacred Sleeping Buffalo rock that marks the turn to the resort off US Highway 2 and know that fishing is available at the nearby Nelson Reservoir. The Sleeping Buffalo is between Malta and Saco, Montana at 669 Buffalo Trail. Winter hours are 10 a.m. to 9 p.m., Wednesday to Sunday. An adult swim is $8.50. Snacks and towel, etc., rentals are available. We stayed for three days and had a great time!